We are nearly finished with the project to convert the old dairy milking shed at CUE Haven into a nursery where we will propagate seedlings for memorial plantings. We hope to make the nursery a focal point for the educational opportunities provided by CUE Haven. To give you some background about the nursery conversion project, it is only necessary to point out two things. 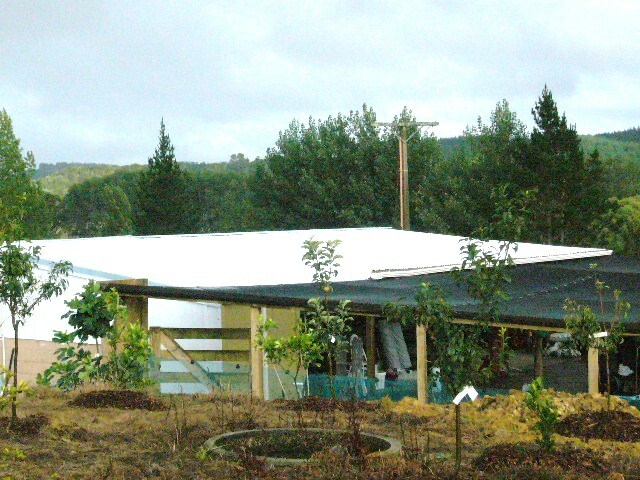 First, dairy sheds are not built to the standard of homes—practicality and functionality are the objectives. Aesthetics are not a factor. Second, it has been a long time since a cow was milked in the CUE Haven milking shed and the years have not been kind to it. 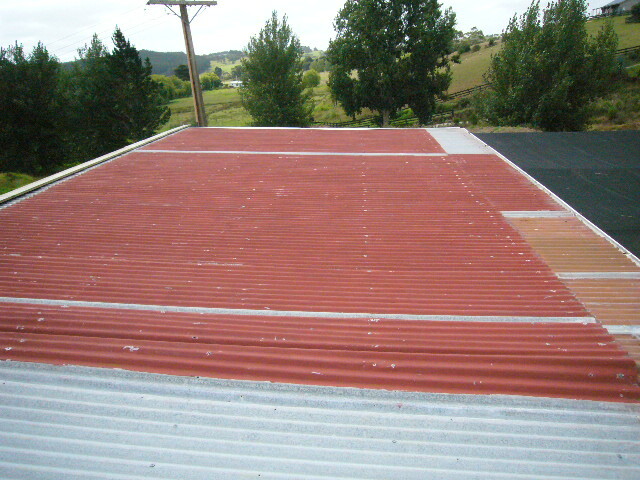 The roof of the shed is corrugated iron. I’m not sure what the truly original roof looked like, but the existing roof was a patchwork of different sheets of iron that may have replaced original pieces or may in fact be the original. The colour scheme varied from plain galvanized metal, to red paint that looked like rust to actual rust. Upgrading the building meant repainting the roof, which was a new concept to us. Fortunately, the roof isn’t very high off the ground, nor does it have an unreasonably extreme pitch (although I don’t know about you, when you are up on a roof, any pitch seems extreme). So Tom got the job. As we looked into roof painting, we heard about the White Roofs Project. The idea is that white roofs reflect heat, which has two big advantages. First, by reflecting heat back into space, there is less local heating of the atmosphere. Dark roofs, which absorb heat, then dissipate the heat into the atmosphere where it interacts with greenhouse gases and contributes to global warming. Second, a white roof keeps a building cooler so there is the potential for savings from less need for air conditioning. Because the nursery is only a three sided building we get natural air conditioning, but by keeping it cooler we would be able to provide a more suitable environment for our seedlings. 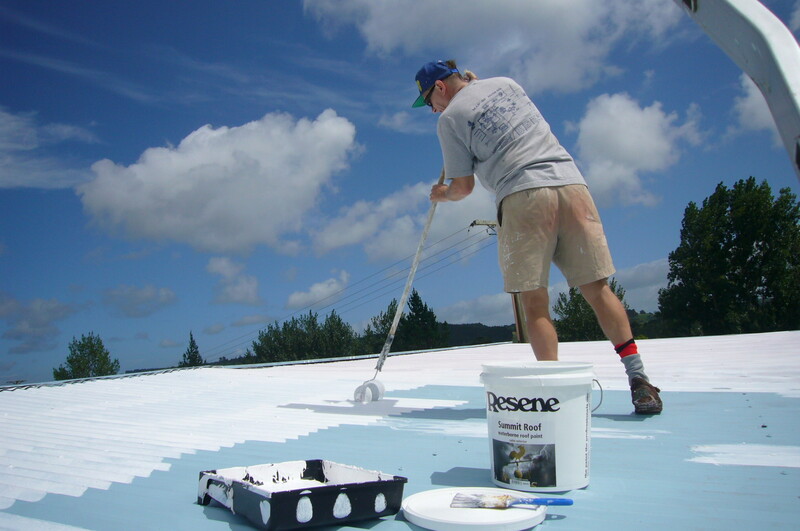 Resene paints of New Zealand participates in and supports the White Roof Project by providing white roofing paint at a very substantial discount. We decided to paint the nursery roof white. Now the only problem was that I had to go up on the roof and do it! Aside from looking much better than it used to, the white roof on the nursery has made it much more comfortable on hot days. I’ve had to spend additional time on the roof to work on the flashing around the edges and it is actually cool to the touch even in bright sun. In the past, you could fry eggs on it! The only thing is, you really want to have sunglasses on when you go up there. We’d like to thank Ian Montanjees of the White Roof Project and Resene for their support and assistance.